Scientists have collected a huge amount of evidence proving that Earth is heating up. Over a century of meticulous temperature records from around the world plus state-of-the-art satellite and ocean-buoy measurements show that the average global temperature is getting warmer and warmer. So: how do we know it’s not just natural? In this post, we take a look at some of the natural causes of past climate changes and explain why none of them explain the global warming we’re seeing today. We’ll start with the most obvious: the sun. The sun is Earth’s only source of heat and light, so it’s natural to assume that changes in global temperatures must be related to changes in the sun’s output. For centuries now, scientists have known that the sun’s heat varies over time. Periods of higher solar output are associated with the appearance of sunspots, and astronomers have been recording the number of sunspots since the 1600s. More recently, we’ve used advanced technologies such as satellites to directly measure the intensity of the sun’s rays. As it turns out, the sun’s output doesn’t change by all that much: modern measurements show that it varies by less than a tenth of a percent over an approximately 11-year cycle. So, not only does the sun change only very slightly, but its high and low cycles balance each other out in the long term. Earth has seen a consistent warming trend despite these ups and downs. Further back in history there were instances when solar output fluctuated much more. The so-called “little ice age” that affected parts of Europe and North America for several centuries ending in the 1800s is thought to have been caused (at least in part) by a decrease in solar output. Why don’t we think that some sort of similar change in the other direction is having a warming effect now? Well, there simply isn’t a trend in solar output that would explain the rise in the global temperature. In 2017 we are at the low end of an 11-year solar cycle, so the past decade of warming has taken place despite low output from the sun. More generally, the amount of warming observed around the world far outpaces any observed change in solar output. There’s more: if the sun was causing global warming, our planet would be warming very differently than it is. 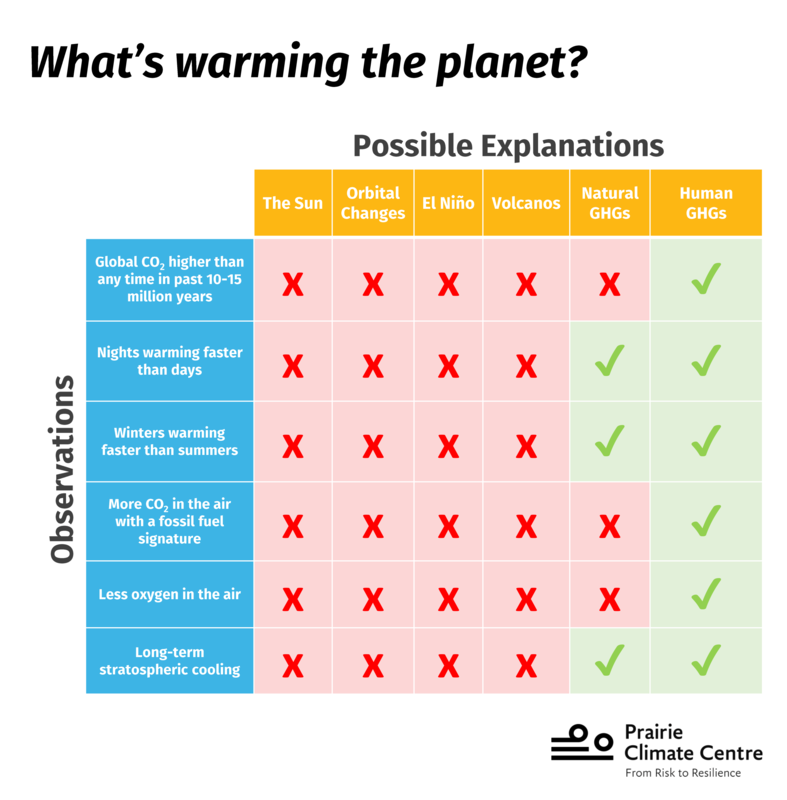 Earth’s warming is more evident at night than during the day and is happening faster during the winter than the summer. That means we are seeing stronger warming when less sunlight is reaching the surface. If the sun was to blame for global warming, daytime temperatures would be warming faster than nighttime temperatures, and summers would be warming faster than winters. But they aren’t. We also know that the lower atmosphere is warming but the upper atmosphere is cooling. If all that extra heat was coming from the sun, the entire atmosphere would be getting warmer. So, there are several different pieces of very solid evidence proving that global warming can’t be blamed on the sun. Is it some other natural planetary cycle? We’ve all heard about the different climates of Earth’s distant past: kilometer-thick ice covering most of North America! Dinosaurs roaming the tropical jungles of Alberta! Images like these make it seem like Earth’s climate flip flops between very cold and very hot all the time. First, let’s be clear: going from global tropical heat to an ice age takes tens of millions of years. That vast span of time is difficult to imagine. It’s enough time for continents to move, rearranging the surface of the Earth. It’s enough time for entire mountain ranges to form, erode and disappear. If variations in the sun’s heat are too slight and too short to explain large changes in climate over millions of years, what did cause those extreme (if very, very slow) fluctuations? Large natural climate changes, such as the beginning or the ending of an ice age, are driven by shifts in Earth’s tilt and the shape of its orbit around the sun; these determine the strength and seasonal pattern of sunlight across the planet’s surface. But these natural planetary cycles change Earth’s climate over tens of thousands of years, and current global warming is happening much more quickly, over just decades. Of course, large swings in Earth’s climate can be caused very quickly by catastrophic events such as asteroid impacts or enormous volcanic eruptions. But obviously we’d have noticed something like that! At other times, the same system of currents operates in reverse, creating La Niña conditions, which have more or less opposite climate and weather effects. So, are oscillations between El Niño and La Niña to blame for the recent surge in global temperatures? El Niño and La Niña events tend to only last for one or two years, whereas global temperatures have been increasing for several decades now. Also: some years have been very warm despite there being no El Niño activity. 2017 is a good example: it’s on track to be the 2nd or 3rd warmest year in recorded history, despite the fact that no El Niño was occurring. Is it natural fluctuations in greenhouse gases? Without the greenhouse effect – the atmosphere’s blanket-like ability to retain heat – life on Earth as we know it wouldn’t be possible because it would be too cold. The greenhouse effect is dominated by carbon dioxide, methane and water vapour. The amount of water in the atmosphere changes all the time thanks to precipitation and evaporation. The amount of carbon dioxide and methane in the atmosphere tends to fluctuate much more slowly. Events that add carbon dioxide or methane to the atmosphere, such as volcanic eruptions and forest fires, are called “sources”. And processes that take these gases out of the atmosphere, such as photosynthesis and absorption by the ocean, are called “sinks”. There are natural fluctuations in sources and sinks. For example, worldwide CO2 levels drop slightly when spring comes in the northern hemisphere because trees across the hemisphere’s enormous forests leaf out and start to photosynthesize. Are natural fluctuations in greenhouse gases to blame for rising temperatures? Scientists have added up all the natural greenhouse gas sources and sinks, and the numbers simply do not explain the observed increase in the concentration of greenhouse gases in the atmosphere. Something (or someone) is clearly releasing greenhouse gases into the air far faster than nature can take them back out again. Okay seriously, what’s going on? The only plausible explanation for what’s causing global warming is human activity. Humans are tapping into oil, gas and coal pockets that were laid down millions of years ago, and burning them to make energy. This releases huge amounts of greenhouse gases, chiefly carbon dioxide, into the atmosphere. These gases are warming the planet far faster than nature could ever do on its own. How do we know for sure that it’s us? Fossil fuels are really, really old. They have a chemical fingerprint very different from other sources of greenhouse gases: the carbon released from burning fossil fuels is different from the carbon released by burning firewood, for example. We can examine greenhouse gases in the air and pinpoint which gases came from which sources. This evidence shows that the increase in greenhouse gases over the past couple of hundred years have come overwhelmingly from fossil fuels. There’s even more supporting evidence in the atmosphere. We know that the concentration of oxygen in the air is dropping (don’t worry: it’s not enough to affect our ability to breathe). Burning fossil fuels consumes oxygen, so if the increase in greenhouse gas pollution is being caused by human activity, we would expect to see oxygen levels going down as greenhouse gas levels go up. And that’s exactly what’s happening. This is a real ‘smoking gun’ that helps prove we are causing the rise in greenhouse gas concentrations that are driving climate change. Climate models also provide evidence. We’ve successfully simulated Earth’s historic and pre-historic climate using climate models. These models take all natural fluctuations into account, including changes in solar output, changes in Earth’s orbit around the sun, volcanic eruptions, oscillations between El Niño and La Nina, and natural fluctuations in greenhouse gas concentrations. When we remove human activities from these models, the global temperature does not increase. The model outputs only match observed temperature records if greenhouse gas emissions from human activity are added to the model. Most importantly: we have ruled out all other possibilities. Science progresses by remaining constantly skeptical about facts and explanations. Many peer-reviewed scientific reports have explored alternative theories for why Earth is warming, including reasons not listed here (for example, cosmic rays and changes in stratospheric ozone concentrations). An overwhelming majority of scientific research papers (97%+) have independently reached the same conclusion over and over again: the warming of planet Earth is being caused by humans.